The busy political map of Whatcom County. Click to Enlarge. How do we predict voter outcomes? How do we create lists of voters in order to contact all the important "swing" votes? 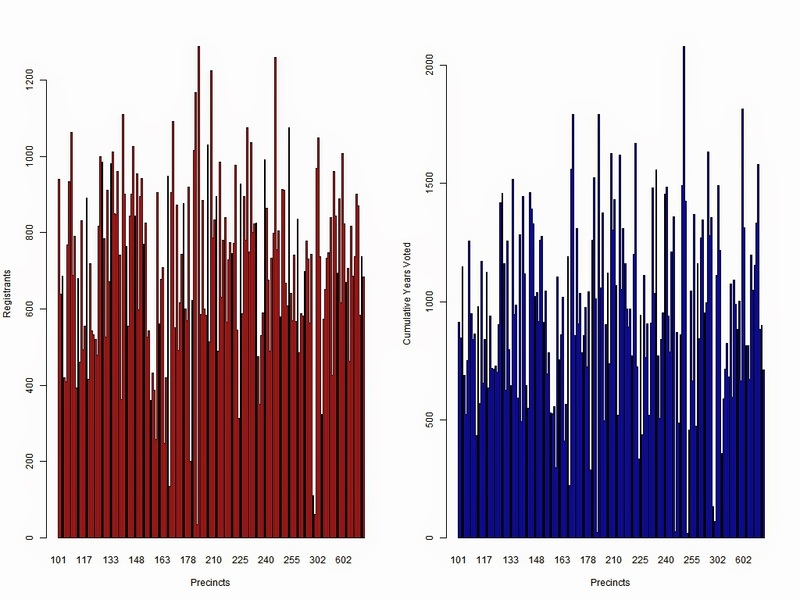 Two predictors for voters are (1) past voting participation history and (2) precinct performance. We can say that a group of voters that has lived in a precinct that votes reliably RED or BLUE for some number of years has some level of predictability. I am looking at precincts vs. precincts, but the same prediction could therefore be made for any voters inside any one given precinct. These type of probabilities are not the highly granular and storied 'micro-targeting' of OFA ('Team Obama') that was used in 2012, but they are a first step toward such. All of the charts in my first part are active voters as of 07.08.2014 with five year primary participation histories. The chart below gives us registrants (in red) and the cumulative participation years (from the past five primary elections) per precinct. 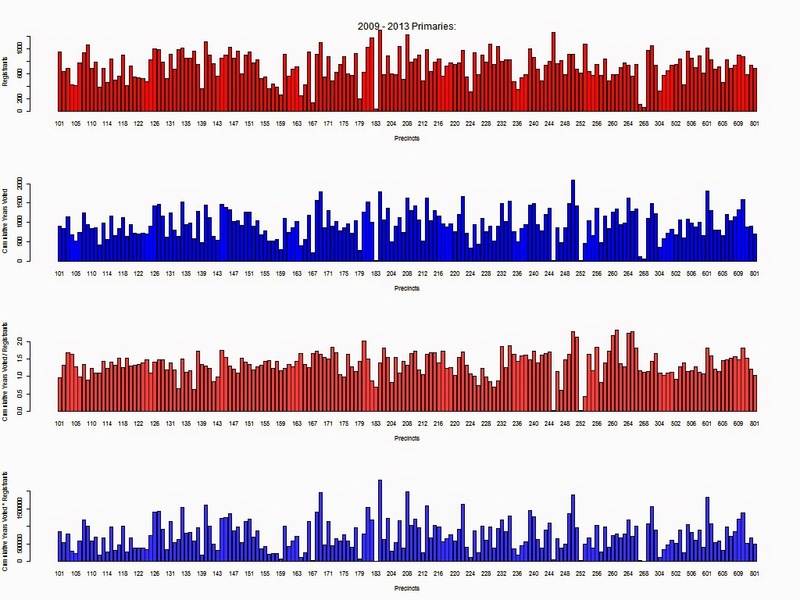 'Cumulative years per precinct' is simply the sum of all the years each precinct voter has participated in a primary election for the past five years. Click on any chart to enlarge. Now, I overlay those last two indices. 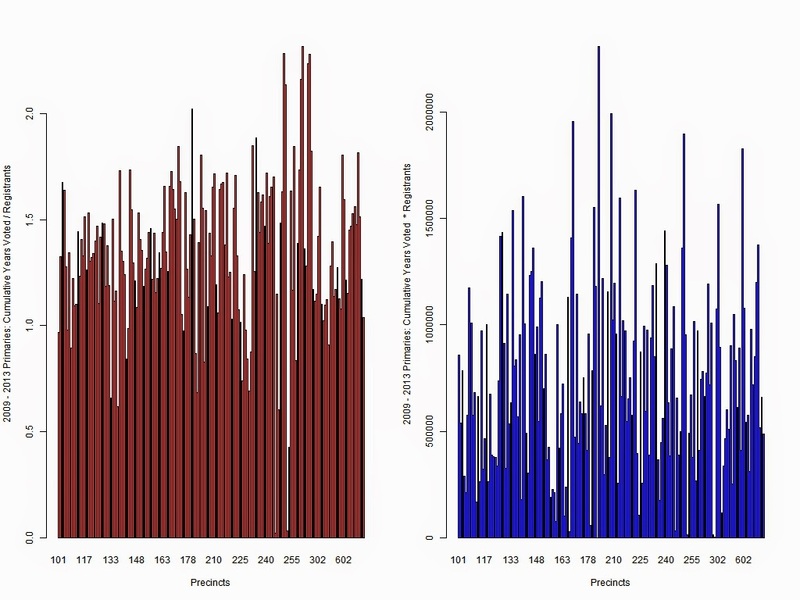 Like choosing any athlete, the precincts that run the longest for the fastest times are the best performers: simultaneously high red/blue peaks are the all star performers. However, in a primary, you may simply want to coax the red peak precincts to vote in their already established high participatory rates. Or you may want to focus on the blue peak precincts to coax out all of their many votes. Or you may want to take precincts with both low red and blue ratios and maximize their votes because you see them as under performing and thus low hanging fruit. 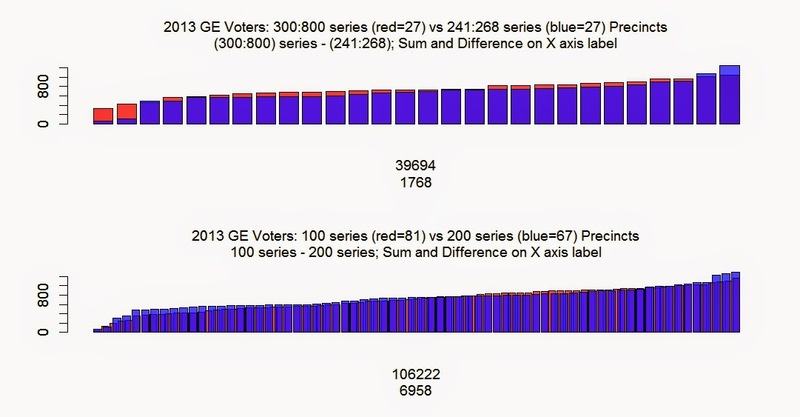 We have been looking at measures of current registration and voting history, but these don't tell us anything about whether the precincts are Democrat (BLUE) or Republican (RED) or the more likely shade of purple that defines most precincts in America. Voter mobility and growth makes accurate prediction of each precinct difficult from year to year. In this analysis, I am using participation in the 2013 General Election as viewed from an active voter list of 07/08/2014. 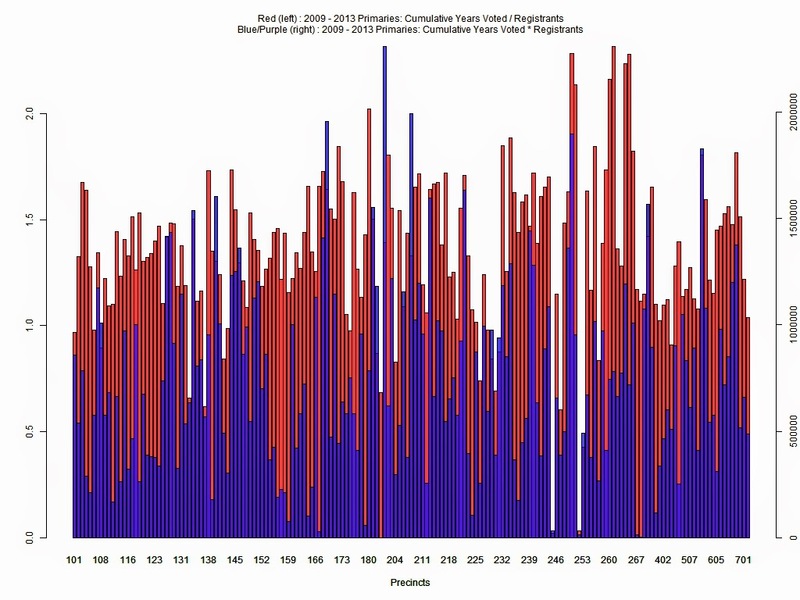 This gives us an historical look at precinct voting performance that is nine months old for current voters. Something more sophisticated would track users who move between precincts and make assumptions about how that would change the 'color' of any particular precinct for the upcoming elections. If we matched last year's GE performance from all the small cities ((27) 300 - 800 series precincts) with the top end of Bellingham's 200 series, it would be a pretty even contest. This reveals how small the actual voting population of Whatcom County's small cities are compared to 27 out of the 67 200 series precincts. In fact, if we pair up the (81) 100 series precincts against all 67 of Bellingham's 200 series precincts, the contest is also very even. However, if we look only at 42nd LD precincts, a strict county vs. city comparison means the county wins 3:1 - if everyone in those precincts voted entirely red or blue. 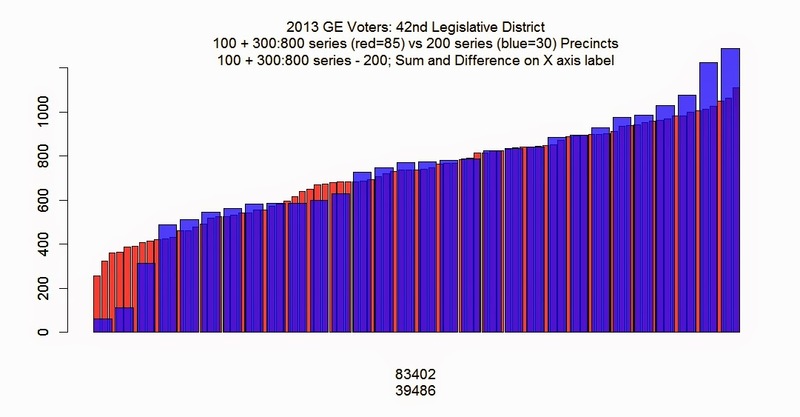 Focus on the number of red columns (precincts) vs. the paucity of blue columns (precincts). So is a BLUE victory a hopeless quest for the hotly contested 42nd District races? Not quite, because in reality, very few precincts are unquestionably BLUE or RED. Most precincts, are indeed, quite purple. The party that maximizes and controls the latent purple usually wins. The Democrats did this big time in the 2012 and 2013 general elections where Whatcom's liberal 40th LD swung its weight for Obama (2012) and against coal trains (2013). In part II, I will dive into the purple of the 42nd and perhaps make some predictions. Code for this post is here.